Posebna hrana za diskuse, prikladna za hranjenje već od drugog dana života. 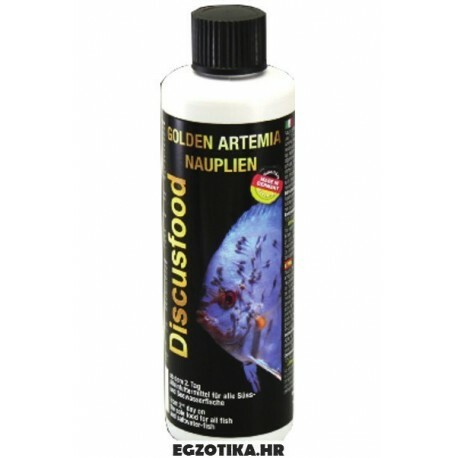 It is a unique food suitable for all Discus starting from the second day of life; consists of enriched brine shrimp (Artemia Salina newly hatched larvae) in size between 115 and 400 microns to be administered directly into the tub. The brine shrimp have several advantages compared to 'use the classic decapsulated brine shrimp eggs. With the 'use of nauplii is administered in a bathtub' large amount of enzymes useful for digestion that Nauplo develops only when closed, enzymes that are obviously not present in eggs decapsulate. In this way promotes the digestion in a natural way and increases the growth of giovnai the fish and invertebrates; The nauplii are enriched by 2% fish oil, providing valuable Omega 3 fatty acids and Omega-6, effective to strengthen the immune system.